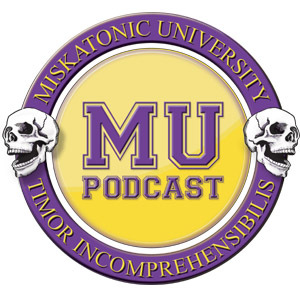 This episode, the full crew is finally back after a long winter’s nap for a discussion about Chaosium’s launch of something called the Miskatonic Repository. This episode was recorded on January 11, 2018. Chaosium has introduced the Miskatonic Repository, a “way for creators to publish and distribute their own original Call of Cthulhu content.” This is also our main topic, so see more below for extra links. Lynne Hardy has been named as Call of Cthulhu assistant editor at Chaosium. Congratz Lynne! Legends of Tabletop did an interview with Adam Scott Glancy that is well worth a listen. They cover Horrors of War as well as some interesting political territory. Kudos to John H and Leah for delving into touchy ground. Matt Sanderson is doing a sequel scenario to Call of Cthulhu in collaboration with propmaker Delphes Desvoivres. The Dark Brood for The Cthulhu Hack – “The Dark Brood offers content about the Black Goat and its Thousand Young, creatures horrible and mindless, including six examples of the Dark Brood, two investigation seeds, Mythos spells and dozens of elements to add the essence of Shub-Niggurath to your game.” A PDF is $3.95. Seven new spider species from Brazil have been named after seven famous fictional spider characters. Including a Lovecraft creation! In other random weird science news, there’s a spider that looks like a pelican. It follows the DM Guild rules. You can do pay-what-you-want or free or set your own price. You get a 50% royalty per download, and you pay $2 for each withdrawal. Scribus, a free layout program like InDesign. Scrivener, software to help organize big writing projects.